Bone Broth for Dogs is a tail-wagging, tongue licking, nutrition packed addition to your dog’s diet. 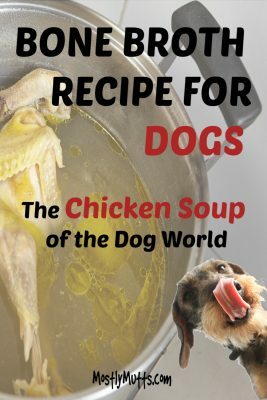 This broth, full of densely packed goodness will please your dog’s palate while allowing you to feel assured you are contributing to his good health. Bone Broth contains joint supporting items like glucosamine. chondroitin, and hyaluronic acid. Bone Broth contains a large amount of Glysine which acts as a liver detoxifying agent. Our dogs are exposed to an enormous amount of chemicals in a normal household, such as: carpets, upholstery, detergents and cleaning products and flea medications. These chemicals work constantly to assault your dog’s liver. Bone Broth to the rescue! Bone Broth is loaded with gelatine which helps with food sensitivities, digestion and allergies. Older or sick dogs can benefit from nutrient-rich bone broth to help make up for what they are lacking due to a poor appetite. The taste may also encourage them to eat when their appetite is poor. Feeding your dog bone broth is a healthy, tasty choice. Fortunately, it is also an inexpensive choice. Making the broth is easy and can be made in larger batches and stored for several days in the refrigerator. Bones! Top choices here are beef marrow bones and poultry bones, mainly: chicken, turkey or duck necks, backs, wings and feet. If you have access to organic bones, even better. Ask the smaller local butcher shops to save for you. It will cost very little for a large amount. Apple cider vinegar, natural is better but not necessary. 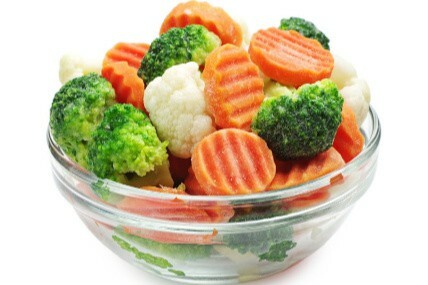 Optional ingredients: Healthy vegetables and herbs such as: carrots, spinach, broccoli, green beans and parsley. Place a large amount of bones into the crock pot. Amount is your decision, but more is better. Cover bones with water until the level is about three inches over the bones. Add apple cider vinegar at a ration of one tablespoon per gallon of water. The vinegar form the gelatin as the mixture cooks. Cover and cook on high for approximately one hour. Lover temperature to simmer and continue to cook for 24 hours. After 24 hours, now you can add any preferred vegetables. Recover and allow to cool. 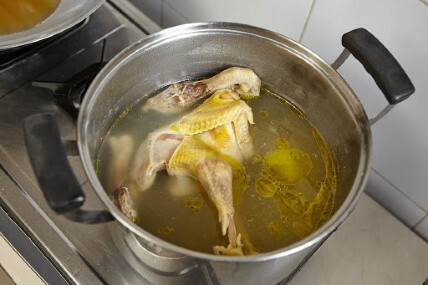 Remove bones with a straining spoon and discard. 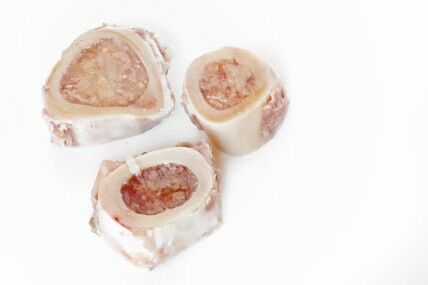 Your dogs should not eat these bones, since cooked bones will chip and break, possibly causing injury to your dog. Refrigerate a couple hours or longer. There will likely be a layer of fat on top. Skim or break this off and discard. The layer below should be rich and gelatinous. If not, try adding more vinegar next time. It can still be used the way it is. So, no waste! 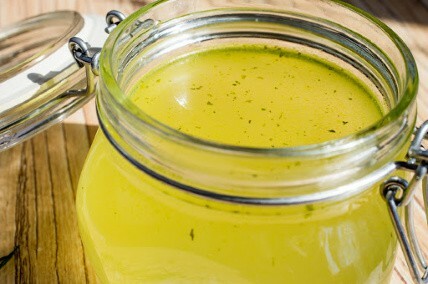 Store your bone broth in covered containers or canning jars. It is also a good idea to freeze some for when your dog becomes ill. You can freeze individual smaller portions in ice cube trays or small plastic containers. They will keep for several months in the freezer. Bone broth bones can often be found at your local grocery store. Ask in the meat department and the butcher will usually save some for you to pick up on a regular basis. I’ve also had luck finding them in the freezer area. Our local store packages them as they cut the meat and sells them in packs of 2-3. Most towns also have local butcher shops where you can purchase fresh meat and get meats cut to order. Ask the butcher to sell you the bones. Your dog’s bone broth can be spooned directly onto your dog’s regular food. Just place it on top. According to preference, you can mix in or not. Although, if you choose to not mix it in, your dog may just decide to eat the broth off the top and decide the food below does not taste as good. The amount of broth you feed is entirely up to you. Several large spoonfuls is usually about right. And, that’s all there is to it. Simple ingredients, inexpensive and so, so good for your dog, both in taste and nutrition. Add bone broth as your liquid when making dog treats. Be sure to refrigerate cookies. Freeze bone broth in ice cube trays for yummy frozen treats for your dog in warm weather. You can order from a great selection of dog bone/paw shape ice cube and baking molds here. If you run out of your delicious bone broth or in a pinch, you can purchase ready-made bone broth here. Both liquid and powder that you mix with water are available. Good to keep some on hand for when your dog is looking at you expectantly and doesn’t want to wait. So, get busy, make your dog some yummy bone broth. His nose will likely be sniffing the air all day, just waiting for the yumminess. And, surprise, the great smelling pot is all for him this time. Stand aside human! Cats love it too, just leave out the spinach. My cats go crazy for it. They’ll go for the powdered stuff too but not as much. It’s so easy to make. I like it myself if I make it from chicken or turkey carcasses of previous meals. I had no idea that a bone broth could so a healthy part of a dog’s diet. I will share your post for my dog friends! My dogs would love this! All of my dogs are over 8 years old, so this would probably be very beneficial for them. 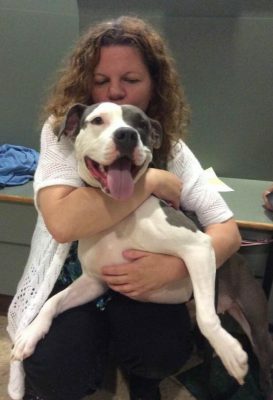 Bone broth, if done right, is so beneficial to dog in so many ways. I have prepared it for Dexter. It is yummy and nutritious.